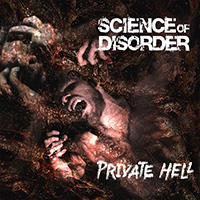 SCIENCE OF DISORDER is a Swiss death metal band with quite the history. They operated for years under the name SOULLESS – from 1989 to 2002, and again from 2007 to 2011 after a 5-year hiatus, returning with a self-descrcibed sound veering more towards death metal. They’ve shared the stage with metal giants ranging from NECROPHAGIST to MEGADETH to DYING FETUS. “Carrions” is an amalgamation of simple riffs, with vocals more akin to Phil Anselmo-style shouting than metal vocals. The overall mix is great – chunky but clear guitar tones, a nice clicky kick drum with some body to it, everything has room to breathe. There are clean vocals at some points – these sections feel very FIVE FINGER DEATH PUNCH with the vocal tone and the simplicity of the riffs. I wouldn’t particularly agree that their new sound veers towards death metal; this is a simplistic mix of modern hard rock and metalcore. “Kingdom Come” continues the trend of clean vocals, extremely simple riffs, and an overall extremely FIVE FINGER DEATH PUNCH sound. This definitely isn’t what I was expecting for a band that has played shows with NECROPHAGIST and DYING FETUS. The extreme simplicity gives me the idea that even for fans of this style of hard rock/heavy metal, it would be hard to sit through all 11 tracks without mixing it up with something else. “Lava Girl”. . . is the cheesiest of cheese. This is veering more into dad-rock territory than anything. “Patient 18” continues the trend of cheesiness. Don’t get me wrong, I like some cheese with my metal, but this is a bit much. The songs themselves don’t see much development or flow. It feels like super basic riff after basic riff. “Choke” has some thrash-style drum patterns that are a nice change from the rest of the album. The tremolo-picked riff in “Light Bearer” was a nice change-up as well. “Half a Life” also has a thrashier feel than the other songs on the album. “Mine” opens with one of the more interesting riffs on the album. This one is also super cheesy, but the riffs are catchy. There’s definitely an audience for this style of music. This is a band for fans of FIVE FINGER DEATH PUNCH and modern hard rock. While the songs are extremely simple and stagnant, the mix is spot-on.